Whereas some wildlife photographers spend thousands of dollars on camera kit and just as much on a plane ticket to get to a location where they can shoot pics or video of some exotic animals, Californian Mark Rober figured he could spend just a few bucks and still get stunning results – and judging by his video, he was right. Mark’s idea was to drill a hole in the center of a $3 mirror and fix his iPhone to the back of it, aligning the phone’s camera lens with the hole. He took his gorilla-cam to Los Angeles zoo and tried it out on the resident orangutans. They were immediately interested and came over to check out the mirror, and in just a couple of minutes Mark had been able to shoot some compelling footage. Talking in his video, Mark said he was inspired to find a way to engage with the animals after noticing how most visitors seemed to be just annoying them. “I was at the zoo with my family and we saw these people just banging on the monkey exhibit, trying to get the monkeys’ attention, and the monkeys couldn’t have been less interested,” he explained. “And I thought, since they’re probably tired of looking at these dumb humans all day, I wonder if they’d just prefer to see themselves.” It was then that he came up with the simple yet ingenious idea of combining his iPhone’s camera with a mirror. 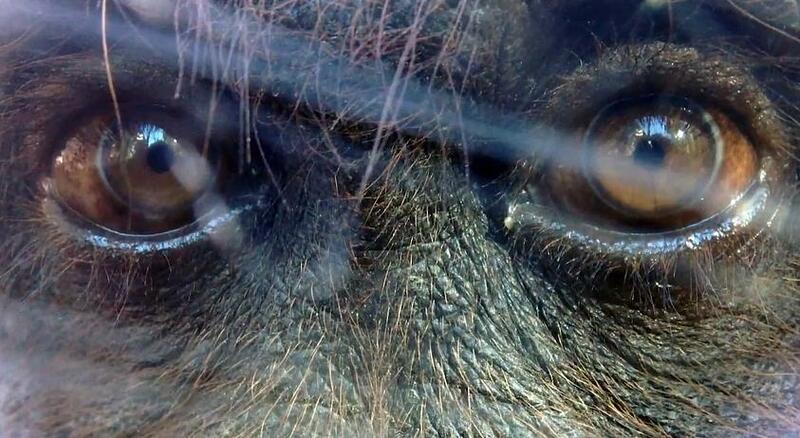 The video shows a mother orangutan looking directly into the camera lens, filling the frame with her eyes. She then grabs her kid who also spends some time examining the reflection, all the while being recorded by Mark. At the end, the father ambles over to “check out his rugged good looks,” as Mark puts it. The entertaining orangutan footage can be enjoyed below.